The JZero Training Events Management System (TEMS) allows you to manage your classroom/face to face training classes and also virtual webinar training events. Incorporated seamlessly into the JLMS Enterprise platform, it provides a single interface, results oriented training system that will allow for blended learning programmes to be easily created. A learning resource management system is available, allowing management of items such as classrooms, projectors, computers etc. This can also be used as a library booking system for the lending of books, CD's, etc. 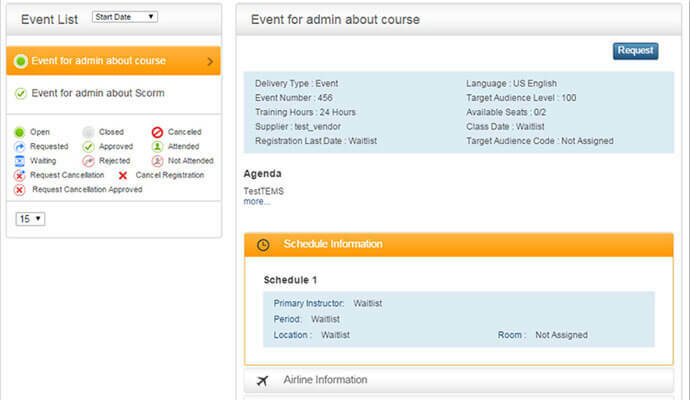 JTEMS is a comprehensive training events system for the management of your classroom based and virtual courses. As it is fully integrated into the JLMS Enterprise platform, it compliments the elearning capability of the system, allowing the scheduling and managing of truly blended learning programmes. Tpgether with the Resource Management system, you have all your learning management tasks in one place.